St Andrew’s was happy to announce that a new little girl, and member of our extended family of care, was transferred to the centre on May 31st 2018 from a Pitesti Centre in the Trivale area. 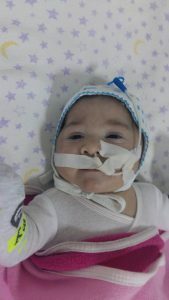 She has been diagnosed with spastic tetraplegia, microcephaly, epilepsy, global developmental delay and gyration anomalies. She is 5 years old and a happy child and likes to be around her peers, to be spoiled and to feel the attention and love during one to one interaction with adults. On 21st of September 2018, the luckiest of days in our personal calendars, an adorable baby girl joined our extended family of care, love and hope. Sara Elena Banu, born on the 26th May 2018, and aged only 4 months old arrived at the centre. 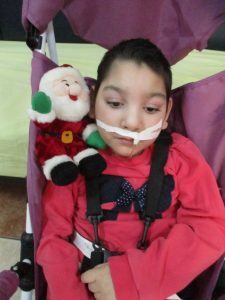 She was taken by our social services team from the Pitesti Children Hospital after the local authorities issued the placement order to Saint Andrew’s Centre. We were informed in advance of her arrival so we made sure all the preparations were in order so we had a nice cot and special pram carriage ready for her so that she is comfortable, warm and safe all the time.